If you're like most people, at one time or another, you've been on some sort of diet, a plan that delivered in the short term, but failed to produce long-lasting results. Your progress stalled and in short order, you were seeking out the next "latest and greatest" weight loss protocol. Why? Because the majority of the protocols out there are based on caloric restriction. In other words, you eat less, and in doing so, slow your metabolism to a near halt, all in the name of rapid weight loss. In essence, you become a less efficient fat-burning machine as time goes by, so it shouldn't surprise you that your weight loss peters out. And not only that, but you are very likely to regain the lost weight when you resume your normal eating. Sound familiar? Well, you're not alone. Quick weight loss schemes abound. And the most dangerous thing of all? They work! At least in the short-term. But what happens six months down the line? Well, the weight loss companies aren't interested. That's not their business model. Their model is to address the emotions of the majority of Americans, nearly 70% of whom are categorically obese or overweight, while at the same time catering to our need for an immediate fix, the "I want it now" mindset. And it works, hook, line and sinker. So you see, your weight loss goals have not been realized not for lack of effort, but because you are going about it all wrong. Have you ever watched The Biggest Loser? Well, what they're not telling you is that nearly all of the contestants regained their lost weight in short order after leaving the show - and the "supervised starvation." And why would they? The majority of Americans empathized with the contestants and tuned in to the program at one time or another. The Biggest Loser was a source of hope - coffers of money for the network - and for many viewers, the "stuff" dreams are made of. And similarly as transient. LOSE BODY FAT. FEEL GREAT. NO GIMMICKS. But what if there was a long-term solution, rooted in science? A protocol to not only lose weight, but keep it off, and at the same reclaim your health - without the trickery, proprietary foods to which you are craftily addicted and without the guesswork. This is not a one-size-fits-all protocol as are most of the commercial weight loss systems championed by a well-paid celebrity or featured on the 1 A.M. infomercial. Seriously Healthy is based on your data. And, there's no starvation. Would you be surprised to learn that I ultimately want you to be eating more than you are right now? That's right. I want you to fuel the fat-burning machinery that's integral to each and every one of us - not starve it - while watching the fat melt off your waistline! All you have to do is Follow The Science. The SOLUTION: MAPPED OUT FOR YOU. Seriously Healthy is your "solution in box." Literally. The fat loss protocol utilized in Dr. Osborn's clinic is detailed in an E-book that also includes a Basic Induction Program for novice exercise trainees. No barbells necessary! Use only the included Exercise Bands and your own body weight from the comfort of your own home. 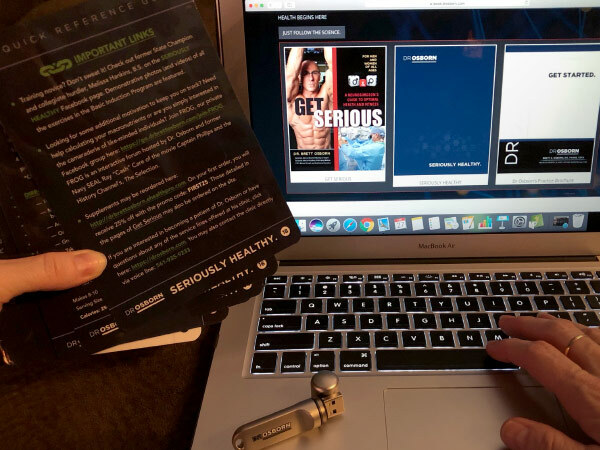 The Basic Induction Program requires only a minimal amount of time per week and serves as an excellent segue to the strength training program detailed in Dr. Osborn's popular book, Get Serious, also included in the Seriously Healthy bundle. Also included is a 30-day supply of Dr. Osborn's four time-tested Medical-Grade Fat Loss Supplements that will not only help you shed that unwanted spare tire, but also better your health: Keto-Nootropic, CarbXzyme, OmegaAvail Ultra and ProbioMed 50. Unfamiliar with supplements? No problem. Directions are laid out for you on the laminated Quick Reference Guide cards that are included in the boxed Seriously Healthy bundle. 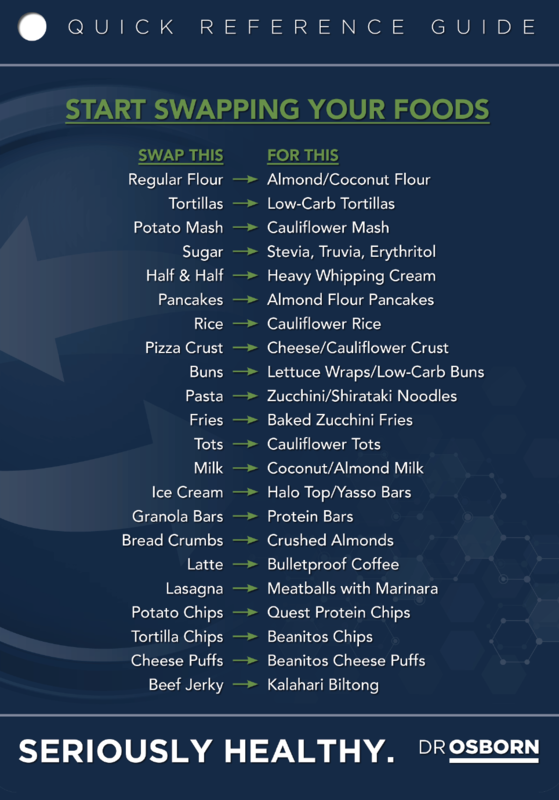 Also included are cards entitled Quick and Easy Low-Carb Snacks, Modified Keto "On-The-Go," and Start Swapping Your Foods, to name a few. The Quick Reference Guide Cards are your blueprint for success. Just follow the directions and allow the science to work for you! A BETTER YOU IN 30 DAYS. By following Dr. Osborn's science-backed Seriously Healthy protocol, you will feel better than you have in years... within 2-4 weeks! During this time, you'll gain the little bit of knowledge necessary to extricate yourself from the pool of potential customers targeted by "quick weight loss" companies. You'll never need another "diet" protocol again. Best of all, you'll have your health, and there's nothing more important! Not quite ready for the entire Seriously Healthy program? Try our Seriously Healthy Starter Pack that includes Dr. Osborn's NEW Seriously Healthy E-book, his widely acclaimed book, Get Serious, and the Quick Reference Cards. A Leaner Healthier You Starts Now. 1. Fill out the form below. All fields are required except for the “Message” field. Once you have completed the form, click the “Continue to Payment” button. 2. You will then be redirected to a payment page to purchase your Seriously Healthy package. 3. Choose from 3 different Seriously Healthy packages — Choose that which best fits your lifestyle and get Seriously Healthy! Fill out the form only if you intend on purchasing a Seriously Healthy package as a DELIVERABLE. If you would like to ask a question about our CLINIC-BASED, MEDICAL WEIGHT LOSS protocol, please Click Here to go to the Contact Page.